Fully rested, we headed out of town, passing through several smaller towns along the way. We were looking for a place to stop for lunch when we see a nice little shady spot just inside a gate. We roll in and start to sit down when a truck with a trailer pulls up to the gate (from the inside). A man jumps off the back of the trailer and starts closing the gate. Neon catches his attention and asks if it’s ok if we stay and eat. The guy says sure, then closes the gate but leaves it unlocked so we can get back out. He starts to walk back down the driveway, then turns to us and says we should come up to his place and eat, that it’s much prettier than by the road. He points to a shady tree, by several large agave plants, and tells us that it would be a nice place for our lunch, then heads over to his little adobe house. The sound of bees fills the air; they’re buzzing around the large agave plants. I investigate what the bees are doing while Neon starts pulling out his lunch. The man comes back and hands Neon a ~half pint container with dark liquid inside; he says that it’s for us, that it’s “agave miel”. For a minute we think it’s honey from the bees flying around the agave, but it turns out that it’s actually agave nectar. He hands us a small loaf of bread to go with it. After chatting for a long time over lunch, we finally get around to introductions, exchanging names. His name is Juan. He shows us where he makes the agave nectar, and his thirty-foot deep well that he and a friend dug by hand. He says if we come back in five years the little agaves will be ready then, and if we want to move here he’ll have a room for us. It’s amazing how much bonding you can do with someone in such a short amount of time. Sometimes connecting with people feels like dressing an open wound; there’s this sweet ache that doesn’t want to let go of the connection. It’s hard to leave, but we say our goodbyes and head out into the afternoon heat. We ride for a few more hours, passing through another town, then higher into the mountains where we lift our bikes over a fence and roll off into the trees to set up camp. A group of cows gather behind us, mooing and bellowing. One cow gets close and starts sniffing my bike. Another cow stands by a nearby tree, rubbing its neck on the trunk, scratching, and staring at me. More cows gather around. They don’t usually come this close. It’s amusing at first, but it makes it difficult to relax and eat dinner when it seems like they might walk right over our stuff. They finally wander off into the hills, leaving us alone to watch the sun set in peace (and quiet). The next morning we stop in a little town (off route), Chapinque, for water and produce, before turning off onto dirt roads. In Chapinque, several locals stop to chat with us, keeping our attention with a string of questions until we finally say goodbye and roll out of town. The day takes us past large-scale farms, and a few smaller ones too, lots of CFL’s and chicken houses. The smell is terrible. The door is open on one of the chicken houses; I imagine little people in all those tiny cages. I remember visiting a chicken house when I was seven years old; it was years before I’d eat eggs again. Later in the afternoon we ride past a small lake. We cross the inlet of the lake at a little stream, where I see I women bent over, wearing a large sunhat. She’s washing clothes. She has several baskets full of clothes, and one of those old-fashioned washboards. I’m a little surprised by this, having just ridden from a bustling city the day before, to something I’ve only seen in old movies. The contrasts we’re exposed to on this journey are enlightening. Not just in what I learn about the world around me, but in what I come to learn about myself as well. Our ride alternates between dirt and paved roads, taking us deeper into the mountains, until hike-a-bike is the only option. We push our bikes through a small settlement, uphill, then ride downhill. A small adobe house comes into view, a donkey tied at the gate, two dogs lying in the road under the shade of a tree. We hear loud music and two women hollering; we can’t tell if they’re yelling at each other, or just having a good time shouting over the music. We push our bikes, steeply, up another hill, past another donkey, around a corner, and into a plowed “field” where the “almost a road” disappears into the furrows of the freshly plowed area. We weave our bikes through the bushes until we pick up the “used to be a road” again on the other side. We come to a T and turn onto a better, and a used, dirt road, then dash off across another field, and over a hill to find a place to camp for the night. I wake in the night to heavy foot steps, opening my eyes to a large white blob standing at a nearby bush. It’s a cow. I lift my head, and see several more. One of them walks up closer, about six feet away now. I get up and tell it to go the other way. It comes a little closer, then finally moves away to the other side of the bush. I walk around our camp, shooing them all away. The moon is full and bright, and Neon is hard asleep, unaware of any large beasts about to step on his head. I wonder how he does that. I finally lie back down, but then hear a lot of human voices. I don’t remember seeing any houses nearby. Something rustles under my groundsheet. I smack around on the top of my groundsheet in a few places; the rustling stops. I listen to my surroundings for awhile before finally falling back to sleep. Sometime later I wake to the sound of me yelling, one of those bad dream kind of dumb, low screams. Something had touched my face, and I think, maybe it was a small snake, then jump up and out of my bag (without even unzipping) in two seconds. Neon is still fast asleep. I decide to turn 180 degrees on my groundsheet, which seems enough to calm me into falling asleep again. The morning played out like one of those silent comic acts; every time we turned our backs, the cows came closer, then turned around like they weren’t doing anything when we’d look at them. One of them stole a piece of Neon’s trash, and got in a few licks on the derailleur before we caught it. It was exhausting trying to keep the cows away from our things while we packed up, but we finally got our things all packed away and headed back to the road. Just a few kilometers later we rode into the small town of Comanja de Corona. After getting a few more supplies at a small store we found a little food stand where a women was making some of the best tortillas I’ve ever had. The corn was coarse-ground, and looked like it had been roasted. She formed palm-sized balls of dough, then placed them on a large wooden press to make tortillas. She filled them with potatoes and nopales for me. They were large enough that I could only eat two, but I asked for three of the tortillas to go. She wrapped them in foil, and a plastic bag for me. Hours later, the tortillas were still warm. I filled them with avocado and tomato. We rode past farms and ranches and small settlements, before descending down into a valley, then back up with a long climb to a high pass where the outskirts of Leon came into view. We looked for camping, but it was all very steep so we continued on. Everything was either steep, exposed, or fenced off, so we kept riding. The sun got lower and lower on the horizon, until finally, Neon spotted a small open gate in a fence line. 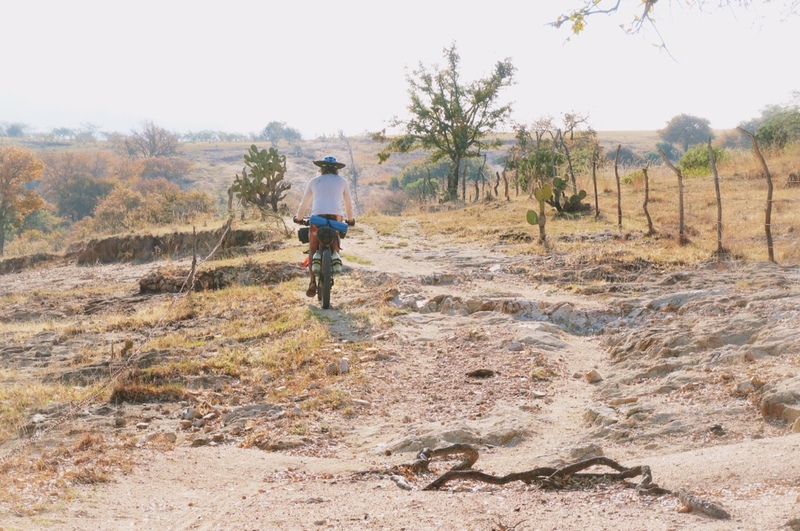 We rode in, across a small field, then weaved our bikes into the tree-sized prickly pear on the other side. It took a bit of doing to clear away the fallen prickly pear pads and sticks for a space big enough to camp, but it turned out to a pretty sweet spot to spend the night. It was more difficult to get out in the morning, like exiting a maze, twisting and turning, and lifting the rear of my bike around everything in the way (while being careful to avoid all the thorns). My bike got caught on a branch and nearly rolled over a big thorny prickly pair pad. I lost my balance ducking under a low hanging branch of one of the prickly pear trees, then stumbled over a small stick-like stump in the ground. A sharp, pulsing pain, filled my little toe. I hobbled out, happy that I didn’t drop my bike into all the cactus, but I could see that my little toe was turning purple and swelling very quickly, probably broken. Hmm, that’s gonna hurt for awhile, I thought. We rolled our bikes across the field, out to the road, and descended down into the valley toward Leon. I was hoping there’d be a cheap hotel at the bottom, but after asking around, the consensus was that the only hotels nearby (and still another 20 kilometers away) were not at all cheap. So I opted for a bottle of wine and we continued on, back up into another set of mountains. We headed toward El Cerro Cubilete, where a seventy-five foot sculpture of christ stands at the geographic center of Mexico. I rested my foot over lunch and we watched several herds of goats pass while we ate. We rode through a couple of more towns before turning steeply up the flanks of Cerro Cubilete. We pushed our bikes, only riding a couple of times for a very short ways, up to a sweet little camp spot high on the mountain. I propped up my foot, sipped on my wine, and watched a goat herder and his goats cross a ridge opposite of us. A few minutes later, another man and his seven cows dropped down from the ridge behind us then continued down the road we had pushed our bikes up. The sun deepened to a red as it set in the smog filled air. We watched the horizon grow dark and the lights of Leon emerge in the valley below. We woke to two dogs, of yet another goat herder, barking at us just as the pink glow of dawn lit the horizon. We were pushing our bikes up the last 350 meters when we spotted a little food stand at the end of the dirt road. Steaming, ceramic, pots of meat and vegetables sat on a concrete counter next to a small fire, where a women stood slicing peppers, and another making tortillas. We parked our bikes and asked what they had …fresh, hot, coffee (made with cinnamon), nopale salad with onion tomato and cilantro, frijoles, and potatoes cooked with sliced peppers and onions and tomatoes (and of course an assortment of meat dishes). I’d gladly push my bike up another hundred mountains (and with a broken toe) if they all had such great food and coffee waiting for me at the top. We chatted with the women over breakfast. They asked a lot of questions about our trip. Neon told one of the women I was an artist. Her eyes lit up big and she said I should take her photo and bring her back a picture next time we visit. I stood up and took several photos, imagining what it would be like to visit here again (someday). We rode the last bit to the summit on a paved road to see the very tall statue of christ, then descended the mountain on paved roads to the city of Guanajuato. We took a wrong turn on the way into Guanajuato, and ended up off route while looking for a cheap hotel, when… “hey, hey, hey” sounds from behind a gate. A guy comes dashing out and says he recognizes us from a photo a friend sent to him and his partner. He tells us that he and his partner are also riding bicycles through Mexico. We chat for a few minutes, and it turned out that the photo they recognized us from was a photo a guy had taken of us in San Jose de Gracia a couple of weeks prior. We didn’t know the guy, but he had asked to take our photo when we were heading out of town there and we said sure. Our newly met cycle friend tells us that they’re working at a b&b (just behind us), through “workaway”. We ask how much a room is; the price he quotes is cheaper than any hotel we’d asked at yet, so we book a room for the night. They give us a lead on an even cheaper hotel in the Centro that’s available the following day. Its funny sometimes how things fall together …if the guy hadn’t taken our photo, if they hadn’t ridden through the same town and met the same guy, if they hadn’t seen the photo, if we hadn’t taken a wrong turn… I love how things line up. It’s like a great puzzle, and every once in a while I get to see how the pieces fit together. We spend one night in the B&B. In the morning, Neon finds a Bialetti in the group kitchen. We share three tiny pots of coffee, savoring every last drop, over cycle talk with our new friends, Lucy and Mike, before packing up and moving on to the other hotel (Casa las Minas), where I was able to keep my foot propped up, thankfully, for several days. We found a sweet little coffee shop nearby, Cafe Tal, that made the best, dark, rich, thick espresso. By the third day I was feeling good enough to explore a bit more. We wandered deeper into the Centro, where we found an Irish pub. I chanced trying a cheaper, local, stout (by Minerva), which turned out to be pretty good. Hard rock played over the speakers. We ate french fries and chatted over a couple of beers. Something stirred from deep down… the taste of good dark beer, french fries, hard rock… it took me back to my teenage years, walking the streets of Seattle on a weekend afternoon. Espresso, good beer, the music, the hilly streets here. It all sort of awakened something familiar, and yet distant, some part of myself I have forgotten about over the years. All part of who I am, but parts that have been blurred out, and lost. Perhaps it all relates to that “dressing an open wound”. There’s this part of life that starts to ache a little sometimes, when we encounter something distantly familiar; it’s like touching souls, and sometimes that soul is our own. Wow such great photos, loved the photo of you and Neon posing with the Christ statue and the contrast of contemporary sculptures located in very old villages is so cool, the Coffee at the small cafe awesome. The story about the guy with the agave Miel and the story of the handmade tortillas made great imagery. Wow Onna !! It’s a great Blog with nice texts and wonderful pics. 🙂 The camp with the cows is funny ( we are the same cows in France ) and it’s very interesting to discover all places, small & large in Mexico. A free trip for the eyes and the mind !! Many thanks for all and i’m waiting for the next story in your Blog. I don’t forget George because he’s with you in all this trip !! It’s like a great puzzle…. Years ago, when I was working at a private boarding school near Eloy, two students who were from Mexico argued as to which city was finer: Guanajuato or Queretaro. It looks like Guanajuato would have much to offer itself. I am curious as to why hotels in Leon would be so expensive.